There is something special you want to experience when it comes to your vacation. It is a period of time devoted to pleasure, rest, and relaxation. Less worries, less work and more fun. The quality of your vacation time is the quality of your plan and this is the time when Shore Details can help you. From Property Management Plans for every owner to a great selection of vacation rentals for every guest, they’ve got your Hatteras Island experience covered. You’ll find their service unmatched on Hatteras Island, just check out their website. Their Popular Vacation Concierge Service makes them special, but what makes them more special is their website, built by Mitro Digital Marketing, where you can find reviews, learn about their services, contact them or even book one of their properties. You can order your linens and pay directly from the website using an authorize.net account or your credit card. All the payments are safe and secured by an https protocol. Also, authorize.net uses data encryption and anti-fraud technology to keep user’s information secure, greatly reducing the risk of online fraud. The website runs on WordPress CMS with a framework from Avada. The Fusion Builder Editor did the magic. Each page has it’s own slide and this cool feature was done using the Fusion Slider plugin. Another challenge was their ecommerce system. We used the WooCommerce plugin. It is a free eCommerce plugin that allows us to sell goods online. WooCommerce comes bundled with the ability to accept major credit cards, PayPal, BACS (bank transfers), and cash on delivery. In their Blog section users can find reviews about Shore Details from Facebook. We use another plugin for those reviews and that plugin is using the Facebook API to pull the data from Facebook page. The website is mobile responsive and we checked multiple browsers to make sure it is compatible for all of them. Michelle Sanchez was put in charge of collecting, arranging the information and optimize the content using the Yoast SEO plugin. The Yoast SEO plugins Page Analysis functionality checks simple things we’re bound to forget. It checks, for instance, if there are images in post and whether they have an alt tag containing the focus keyword for that post. It also checks whether the posts are long enough, whether we’ve written a meta description and if that meta description contains the focus keyword, if we’ve used any subheadings within the post, etc. etc. Victor Rusu managed the coding and building of this project using WordPress CMS with the plugins and Teuta Towler handled the on boarding of the client. 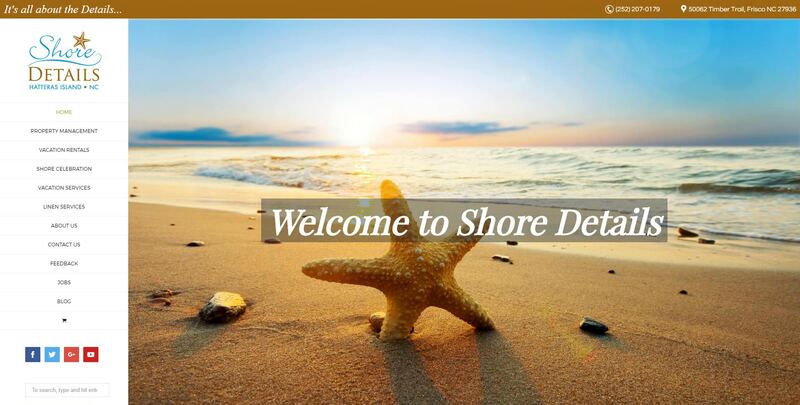 As a property management and vacation rentals website, ShoreDetails.com has pleased our client above and beyond as well as bringing in more traffic and visibility to Shore Details and its unmatched services. Just as Shore Details says “…It’s all in the Details,” therefore we at Mitro Digital made sure to cover ALL the details involved in this project. What is the best time and day you can be reached? How did you hear about Mitro Digital Marketing?